Description: Perennial grass-like herbs, tufted or rhizomatous. Culms terete. 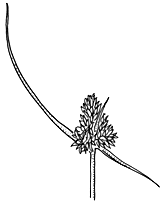 Leaves basal or occasionally 1 or 2 cauline, flat or channelled; margins moderately to densely white-villous, mostly minutely papillose, sometimes nearly glabrous except for fringe of long white hairs near base of blade; auricles absent. Lowest 1–4 involucral bracts leaf-like. Flowers bisexual, clustered ± densely, each with 1 papery bract and 2 papery bracteoles. Tepals subequal in length. Stamens 6[–3]. Ovary 1-locular. Capsule smooth, or minutely papillose near apex, shining; seeds 3, with a white basal, ± fleshy outgrowth (caruncle). Distribution and occurrence: World: c. 80 species, mainly extra-tropical regions. Australia: 15 species (12 species endemic), all States except N.T. Some specimens may be infected by a fungus that causes elongation of flowers and darkening of the tepals. The key and descriptions do not cover such individuals.